I woke up around nineand quickly looked out the window and checked the thermometer, blue skies, sun, -18C and only a medium wind, In other words perfect conditions for some dogsledding action. I prepared a good breakfast and plenty of hot chilli tea, including a big thermo of it for the trip. Packed up food for a day out (the trick here is to bring food that does not contain too much water as it want freeze up in cold weather, i.e. go with dry bread instead of dark bread, or toast your dark bread) and started to get dressed. Dressed up, I grabbed the fully pack camera bag and began the short walk to Espen’s house. I said briefly hi to his wife and new born son, before we headed to his car for the drive to the sled dog yard. Here the real work began. First we padded the sled seat and tied down the riffle (small bore in case we should come across any grouse on our way. Next up came the sled bag hanging from the “opstander” (the par to the rear of the sled used when running behind it and when breaking and steering the sled downhill). Then we mounted my camera bag and began harnessing the dogs. 20 very eager and enthusiastic sled dogs later we sat down on the sled grabbed firmly on the sled webbing before the sled shot out from the yard and onto the sled trail (read: road for dog sleds) leading through town. As the sled trail cleared of the last sled dogs and we set off, we saw the road was blocked by a bunch of parents having arranged a sled dog race for kids on the main trail leading in and out of town. We avoided a couple of near collisions and walked the dogs past the area, before moving on at full speed. We cleared the steep mountain passage leading out of town and followed one of the main trails leading from Ilulissat and into the fiord where the ice fishers usually resides. 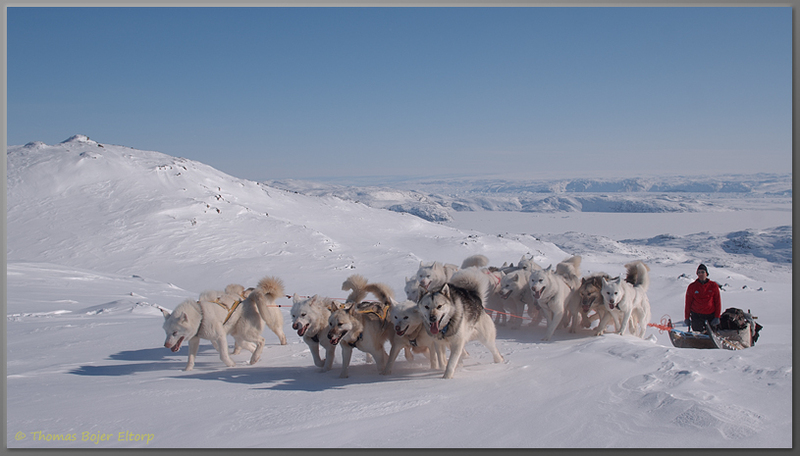 As we reached the downhill passage leading to the fiord, we did a sharp left and lead the dogs up a steep snow covered mountain side before continuing straight north. Clearing the ridge where we have a full view of both the UNESCO world heritage listed Icefiord and the smaller fiord where the ice fishers earn their living, we started a very exiting downhill section of deep snow and slaloming around vertical drops, Espen focused on the difficult job of guiding the dogs, me with the comparatively leisurely job of breaking and steering the sled. Soon we reached a plateau of lakes with no wind and wonderfully deep snow. A perfect location for having lunch and allowing the large span of hard working dogs to rest a bit, even though they seemed as eager and enthusiastic as they did when we set out. Clearing the plateau we reached the steepest section of the trip, a waterfall leading from the lake plateau and into the river. 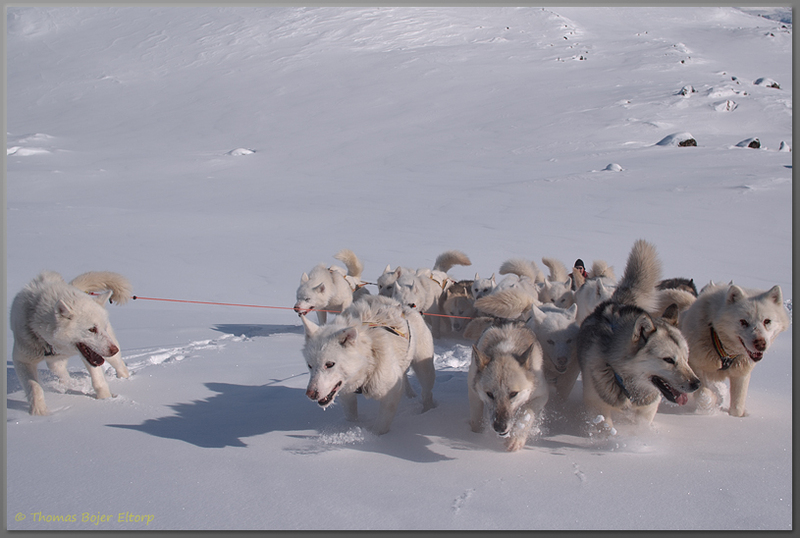 Here Espen lead the dogs behind the sled and took command of the sled. 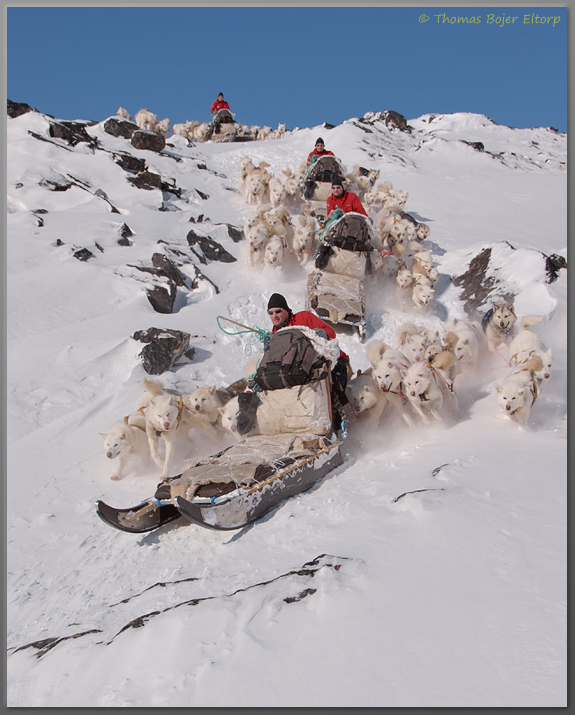 I made my way down in advance, walking and sliding the narrow passages between the rock outcroppings and watched Espen expertly guide the sled and dogs down at very high speed. From here we drove on the river onto a huge lake near a hunting cabin called “the sky hut” and from the onto the main sled trail between Ilulissat and Oqaatsut (rodebay). Providing us with a smooth ride all the way back to Ilulissat. Nearly 50 kilometres in steep mountains and deep snow, a long but amazing trip. Back at the dog yard the dogs were taken off the sled and led to their respective resting areas, before the lines and harnesses checked and tidied up, before the sled finally was unpacked and we were ready to go home. Espen would then return later to feed them once they had had the chance to wind down from a hard day’s work. Safe to say that sleep came easy that night, I barely managed a basic meal and a warm shower before dosing off.